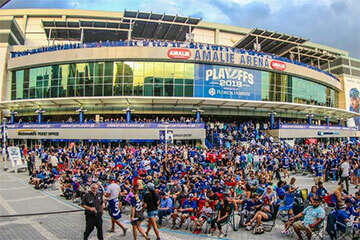 The Amalie Arena is located in Downtown Tampa’s Channelside District. It has been a venue for ice hockey, basketball, arena football games, and concerts. It is home to the Tampa Bay Lightning (National Hockey League). Boasting unique features like lightning-throwing Tesla coils, the 11,000 square-foot Budweiser Biergarten with incredible views of the city and a massive five-manual, 105-rank digital pipe organ, AMALIE Arena consistently ranks among the very best venues in the United States.